Explanation: On 12 February, 2001, the NEAR-Shoemaker spacecraft gently touched-down on the surface of Eros -- the first ever landing on an asteroid. During the descent, the spacecraft's camera recorded successive images of the diminutive world's surface, revealing fractured boulders, dust filled craters, and a mysterious collapsed channel. The last frame, seen in the above montage at the far left, was taken at a range of 128 meters. Expanded in the inset, it shows surface features a few centimeters across. Stereo experimenter Patrick Vantuyne, constructed this montage from the final images in the landing sequence, carefully identifying the overlapping areas in successive frames. 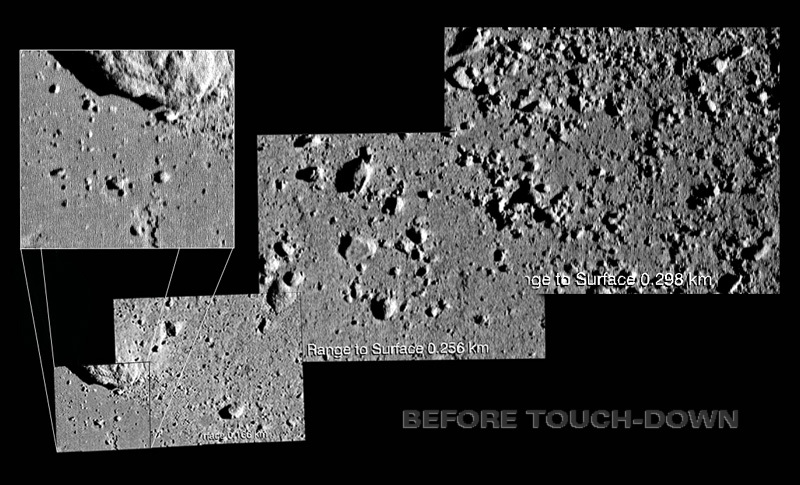 Frames which overlap were taken by the spacecraft from slightly different viewpoints, allowing Vantuyne to construct close-up stereo images of the surface of asteroid 433 Eros.